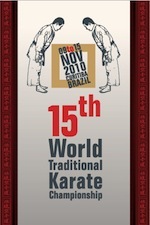 Teaching classes, the business of running a dojo, ones personal practice, attending classes and seminars, hosting international guests, unofficial meetings with ITKF officials, planning the future of Traditional Karate locally & internationally, Karate Camps, Kyu Exams & somewhere in there a personal life. We will follow up on the February issue and get going on the March issue. The bottom line is that if you want something then you have to do something. Thanks to all of you from across the country and around the world for logging on. Thanks for your kind words, comments, suggestions & most important for your support. Even the ox is fantastic! Watch him just before he gets it. 2 for the price of 1 SPECIAL ! ! ! January 10th - 15th - USA, Beverly Hills, Ca. 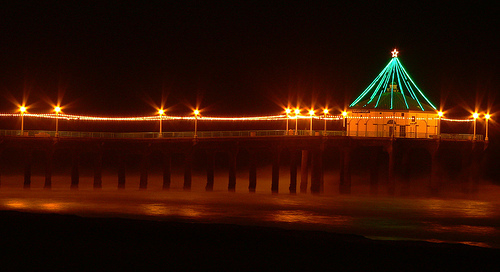 January 10th - 15th - USA, Manhattan Beach, Ca. Please submit news for posting. January 6th - Lithuania, Baltic Sea. please submit any international news for posting. 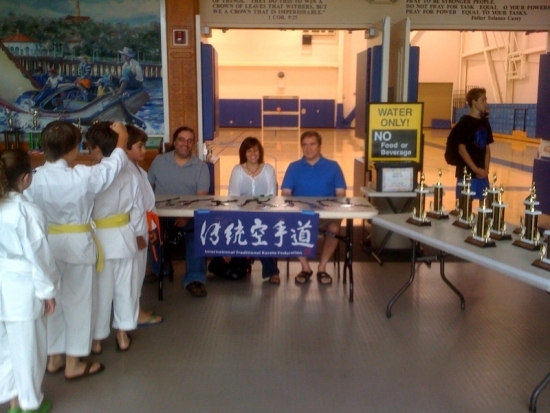 Will host its' once a month at the end of the month, Open House/ Belt Exam/ Award Class. The class is open to all! Other clubs and ronins welcomed. Bring your friends and neighbors. No gi required for first timers. Bring a car load. Let's pack the gym. There is pleanty of room. Free, easy parking. 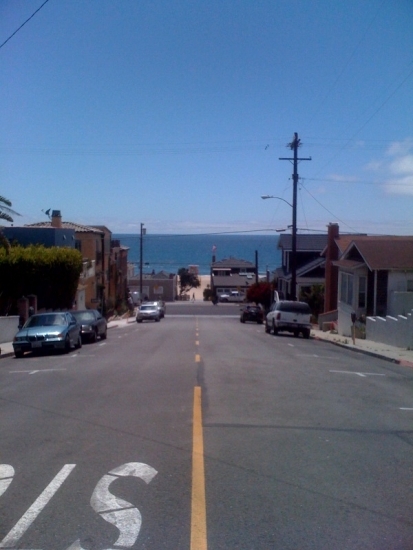 Then after class you can enjoy beautiful downtown Manhattan Beach. It's much like being at the old International Summer Camp, held at UCSD in La Jolla. Good training then go out and enjoy a great little sea side village. No charge to Manhattan Beach Club Members. $10 at the door for non memebrs. Will host a Christmas Karate Class, open to all. Other clubs and ronins welcomed. A great family SUNDAY night. 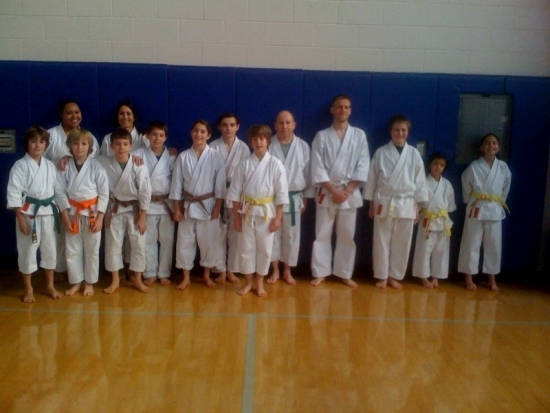 Open House/ Belt Exam/ Award Class. Will host it's first ever! 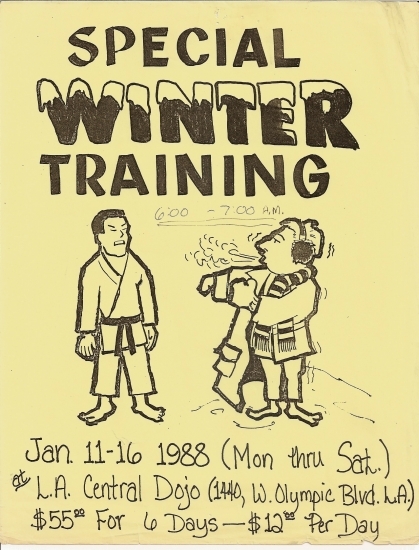 Not to be confused with the "Special Winter Training" in January 2011. Please give us your feed back. If the week before or after Christmas would be best! If you have Local News please submit for posting! Nothing to report. Please submit news for posting. please submit any news for posting. We continue to preserve and to hand down the life's work of Nishiyama Sensei and the life's work of the Masters before him, handed down to Nishiyama Sensei. 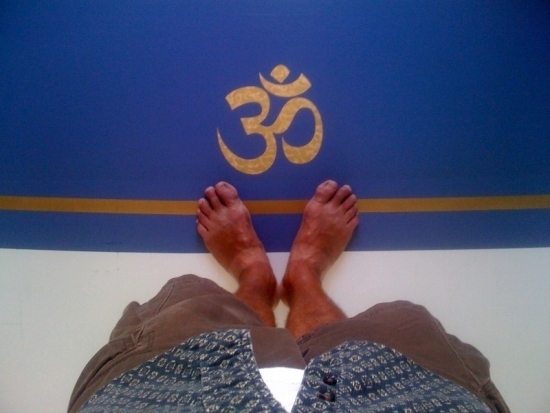 We are fresh and not stagnate, the water is pure. We continue to hand down this refined precious treasure. We are tuned in to the progression of the next stage/s of refinement. The pieces continue to fall in to place, as if all by themselves. It's magical, it's incredible. The answers are all there in front of us. The more I teach, the more answers fall before me. I can't wait to teach my next class. 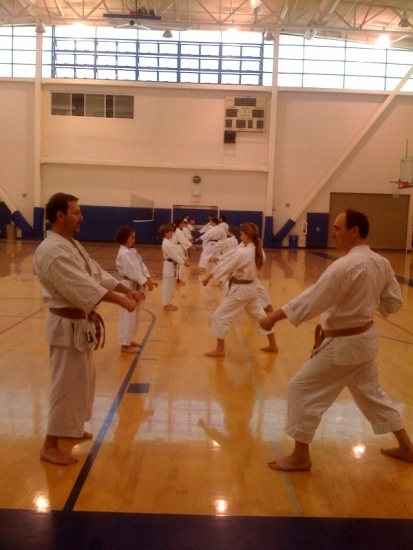 Be it Heain Shodan, Sochin, Kitei or anything else in between. Also to introduce the next stage/s of refinement. Sorry for the delay in getting this issue up. 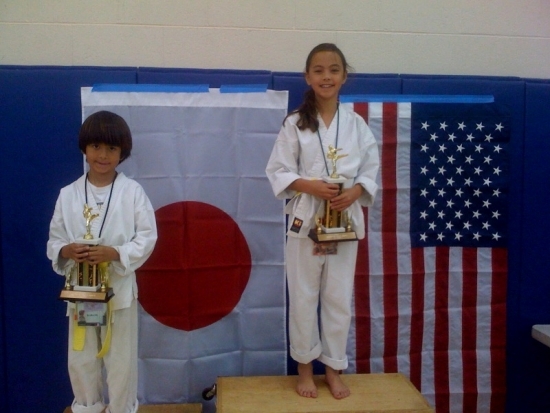 We've been very busy this month, with the grand opening of the new Hermosa Beach Location, Hosting Karate tournaments, Summer Programs and expanding our schedule. Please, please, please click the link to comment on Zachs clip. There are two spaces here. They have been empty maybe 2 years now. They are available at $900 ea. 9 students at $100 per month covers the rent. There are fantastic opportunities out there. The worst that can happen is that we fail. 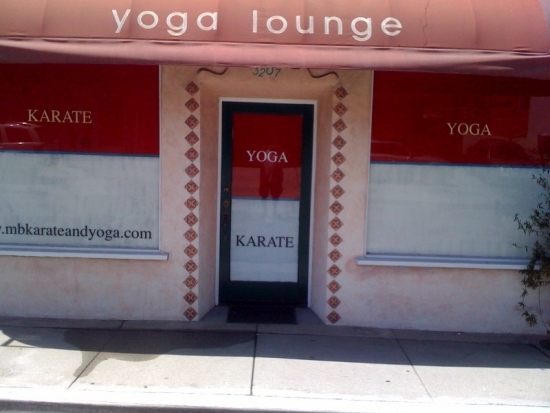 The Hermosa Beach location is now open. A fantastic location, just 1 short block from Los Angeles's best wide, white sand, beaches (Manhattan Beach & Hermosa Beach). As of this writing over 20 classes have been held at the new location. When in town please be sure to visit. This is our only drop in class. It is open to all. No gi or experience necessary. Bring your family and friends to try the class and watch the exam. $10 per participant. 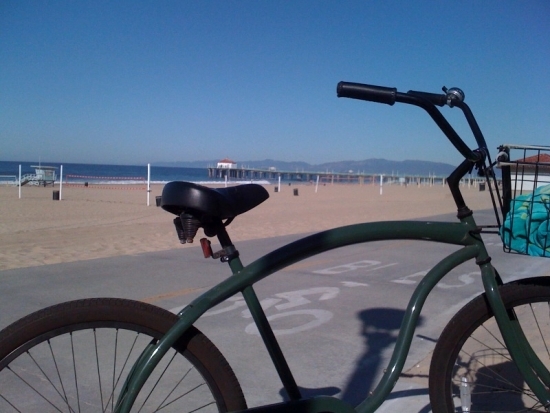 Hermosa Beach Studio Location & down on the Beach. $50 per day or $200 for all 5 days. Sign up now camp size limited. We are almost full! Limited to the first 21 that sign up. 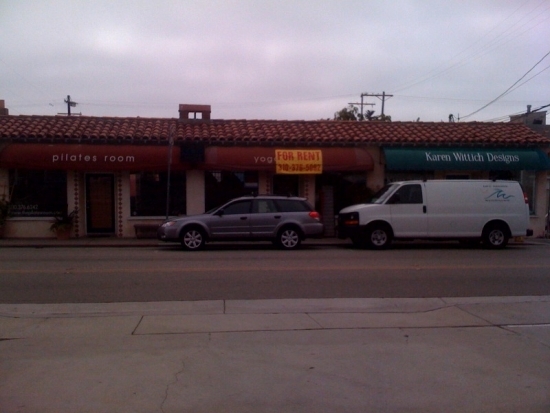 Manhattan Beach Karate is still seeking donations of just $5 for the new Hermosa Beach Dojo . 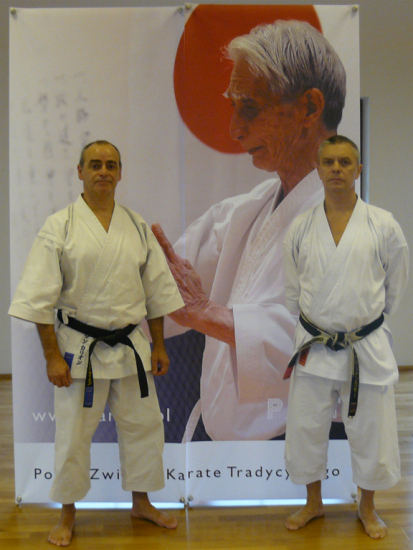 After having spent at least 6,000 hours with sensei, I am still receiving lessons from him each and every moment. Specially when I teach, it triggers a flashback, a moment in sense's class. Often it's a reminder, many times it's something that he said and I understood it to certain point then and now I understand it more deeply, as time passes, as I teach, the more I teach. 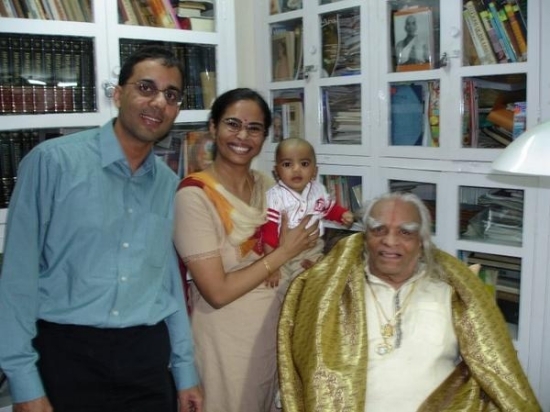 I am greatful that in his mastery he planted these seeds for past 27 years. They have grown, are growing, will grow. I find myself also planting these seeds in my students. Knowing they will sprout later, hoping the student will continue practice, to receive more benefits. So I am excited each and everytime I awake and everytime I put on my gi. I know I will get reminders, I will see things deeper and most importantly he has set the coarse for me to figure out the next steps. I am backloged with subjects I want to share, cover & study with my students. This in turn will bring forth more knowlege (treasure) that will be uncovered through the principles established by sensei. Opps! I have just given away a BIG secret. For the near future I will not put these (secrets) in books or DVDs. They will be given to those that come. They must not be loosly thrown about. Your level depends on this accumilated knowlege. What I know is that effort and time spent is equal to your result. I see it everytime a new crop of my students reach a high level. It's fantasic when all at once, other stunedts reconize someting has happened, when another student reaches a new level. They don't exactly what and how, but the evidence is there. So I stick to the principles. There are these blossoming levels that are attained after so much work is put in. Then we go to the next step. On and on it goes. He was a genius in what he did. I see why he did all that he did the way & why he did it. It was the most fantastic chess move done to deal with what he was confronted with. 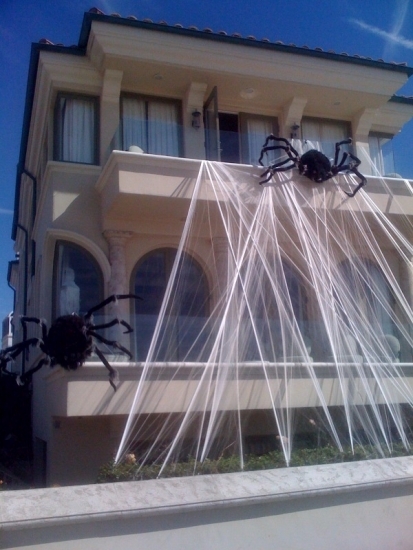 Those that try to distroy or distort his work will get stuck in the sticky web. People who want to change his work should create their own "RYU" (school/ style), this is common, this normal, natural, this would be respectful as it would be their's. Located in beautiful Hermosa Beach. 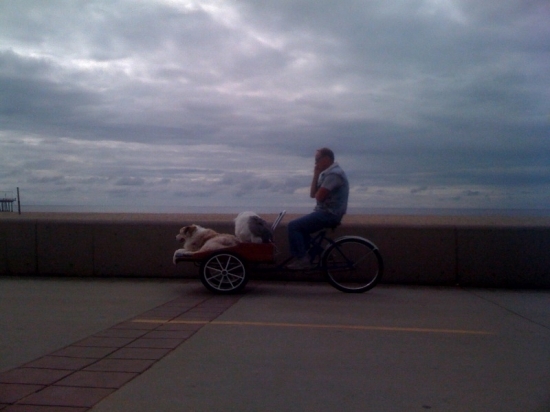 August will be our 14th year in Manhattan Beach & our 18th year in the South Bay. 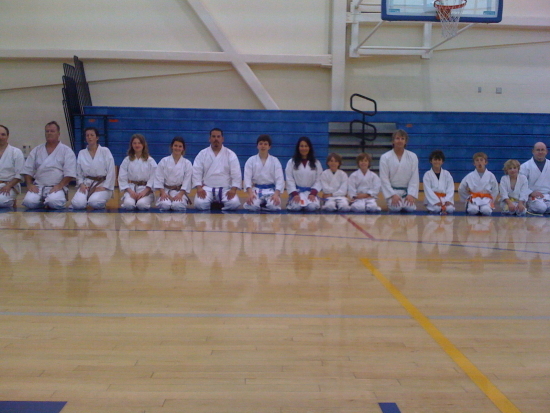 We taught in Palos Verdes Estates before coming to Manhattan Beach. Sign up now before the deadline! Becker's Bakery (in Manhattan Beach) newest creation. Anglefood cupcakes & mini cupcakes with real, very rich, whipped cream and a fantastic, ripe, very flavorable strawberry. Tell them you saw it on our website. Do you use Google AdWords to advertize? If we combine our resourses we can get greater coverage at a much lower price. We must unite to get even, national, coverage linked to one directory. We need mass exposure! If you have ideas to share submit them for posting. After being in the construction trade for many years I know nothing can be built if no one does a thing. Plan, plan, plan - work, work, work and little by little it will be built. 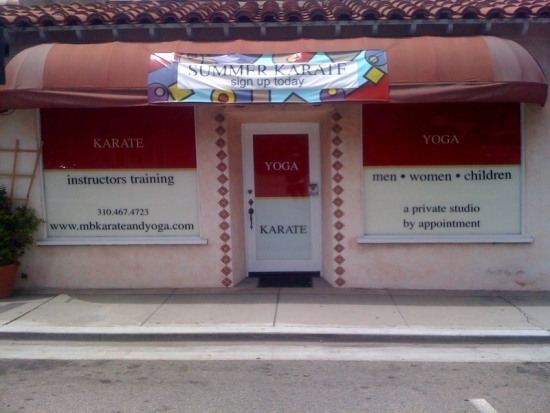 Manhattan Beach Karate is still seeking donations of just $5 to get the new Hermosa Beach Dojo up and running. Keep in mind the at the moment the time is bleak but the future will be the brightest ever. Be ready! La Jolla, San Diego, U.S.A.
We can prevent the chain of Tradition from being broken! We are still looking for ANYONE interested in keeping the Tradition. Scroll down to last months story. Once the date passes the chain is forever broken. We all need to grow! 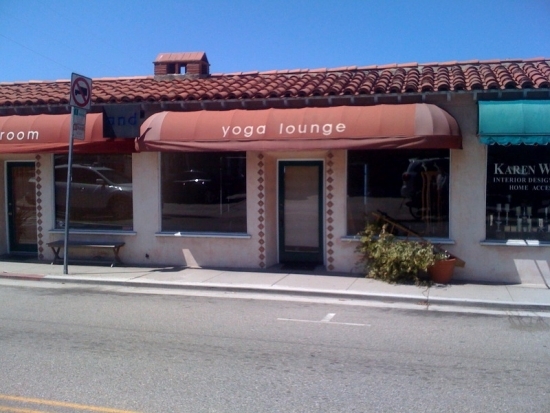 We have just secured a space for a new DOJO in Hermosa Beach, California. Just 12 minutes south of LAX International Airport. A fantastic location. The beach is this far away. We are seeking your help. We are asking for a little help from many. A little from many will make a big difference. We are asking for a donation of just $5.00 to help get the space ready. We will use the funds to get the space ready to open and to keep the place going till it can sustain it self. We are taking a huge risk in times like these but feel with a lot of hard work, it's doable. 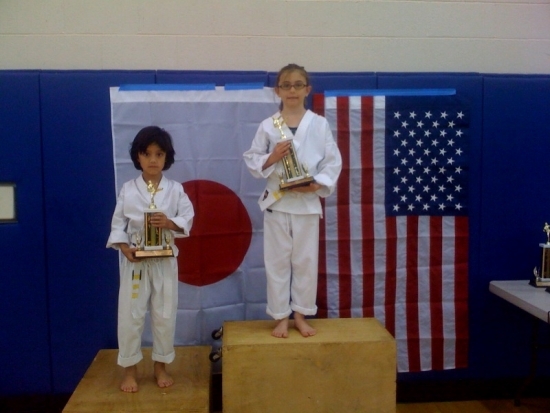 We are doing our part to spread Traditional Karate by aggresivly opening up new DOJOS. 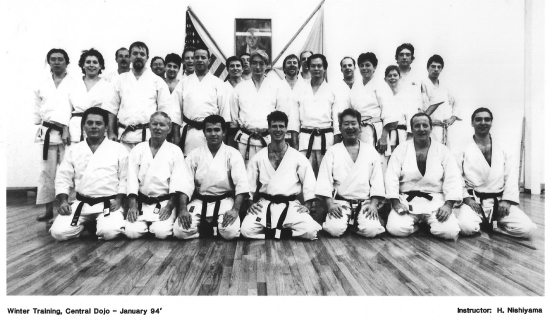 When sensei first came to the U.S. he lived in Hermosa Beach. 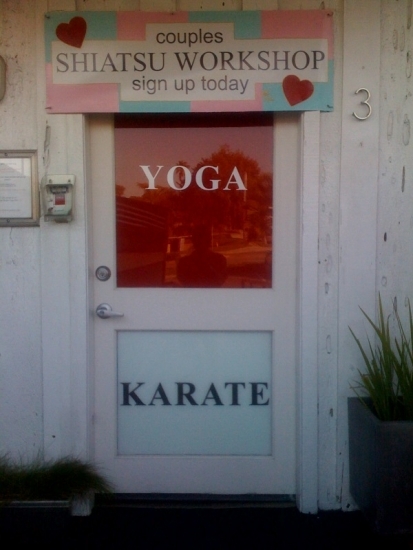 So it's really fantastic that there is a now a dojo in Hermosa Beach. When I run along the beach I imagine that perhaps sensei also ran along the beach. To continue the spirit is a great feeling. Click the link to our "Donation Page" to make your donation. Thanks you for your help. If you are not able donate, we thank you for your best wishes. If you are ever in L.A. please come by and visit. If you need a place to stay, I often have an extra room. You are welcomed to stay here. We can also set you up to stay in one of the dojos. We have a blank wall. 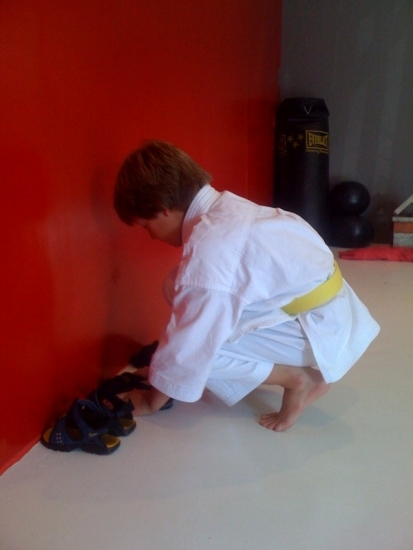 If you make a donation to our new dojo we will write you name on our "Wall". If you can't make a donation at this time & are unable to drop by & visit, then please write back and send us your "best wishes". We will also write your name on the "Wall". Send us you name, city, state, Country. A pic would also be nice. We would like to see names from across the country and around the world. We would like to know that our efforts are supported by all. Please, please, please pass the word. 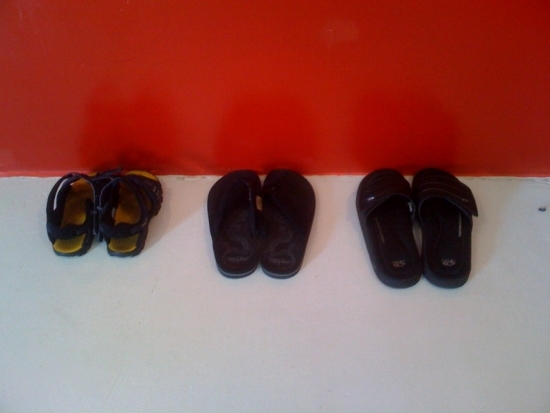 Originally the camp started with sensei and a few students renting a beach house. A few people coming together to train. Junior students taking care of the senior students. The rest is now history. Well I am willing to drive down (100 miles) very early Saturday morning on the day the camp was to be scheduled. I'm willing to be on the beach at 6:00am. 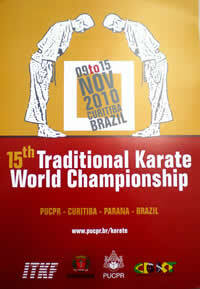 To be there, to run, to train and not let the chain of almost 50 years of Tradition be unbroken. We'll take a photo, post it & we'll keep the Tradition intact. Depending on PARTICIPATION, ideas and suggestions. We can expand on this. 1).We can shoot for every morning, for the week. 2). We can regroup in Manahattan Beach/ Hermosa Beach. 3). We can look for a beach house in La Jolla. But we can do something, if we wish to do so. It is possible to keep the chain of Tradition unbroken. Once the day passes and if no one is there, it can not be regained. Then for 2011 we can rebuild and expand. "the Karete Kid", the movie will be out June 11th. 100's of million of people will go see it. Millions of people will want to learn karate. Ok in the movie he does Kung Fu, maybe there is a Karate tie in, I don't know. But in either case millions will want to learn Karate. Are you ready? have you made preperations to draw from this pool before it evaporates? It's a once in a 10 year opportunity. 10's of millions of free advertizing. We have ideas and suggestions and are open to hear yours. Don't miss the boat handed to you on a golden platter. 2nd Place - James S.
Please submit photos to post. We have condensed the previous 4 pages from the site & have left them in tact at the very bottom. We have plenty of room please come visit. 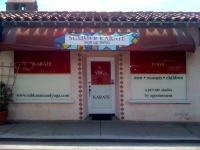 @ " the Gym "
Summer in Manhattan Beach, California U.S.A.
Another Brand New Dojo ! 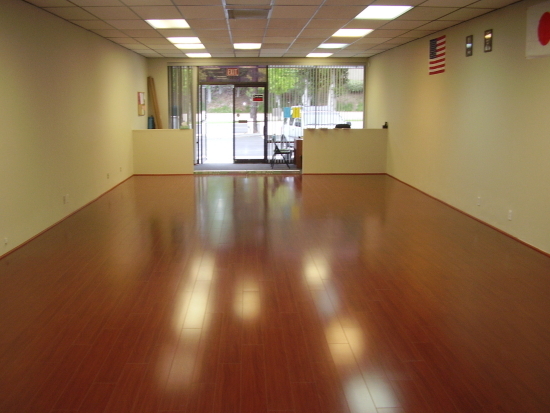 A brand new floor installed in a brand new dojo. 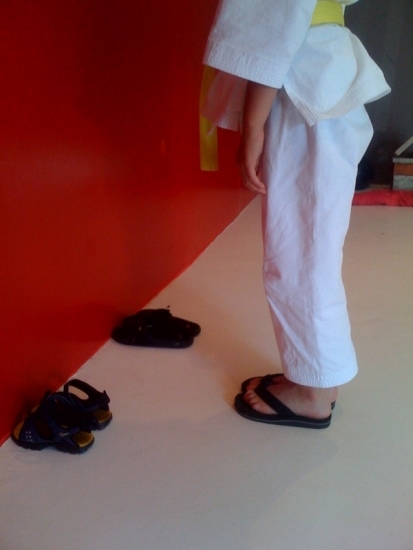 Right now is the best time to seek out opportunities (to open up a new dojo). You can't escape the numerous for lease or for rent signs. Deals can and are being made. But you have to step up to the plate. If you have some questions or would like some suggestions please write. Get motivated! We have a plan/a blue print for DOJO GROWTH, if interested contact us. Stay tuned for other & future developments. The general tournament at Nationals was a way to allow smaller regions that wouldn't have a "Regional Tournament" or others who could not make their Regional Tournament, to qualify for Nationals. 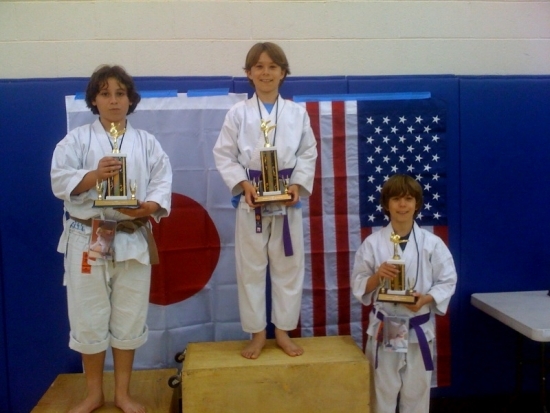 Originally if you competed in your Regional Tournament sensei would not want you compete in the General Tournament in the same event (you had your chance so to speak), but as sensei saw there was greater participation....., he later encouraged all to compete in the General Tournament to qualify for a spot at the U.S. Nationals. Sensei wanted greater participation FROM ALL! My wish for U.S. Nationals is to have greater participation, not smaller. 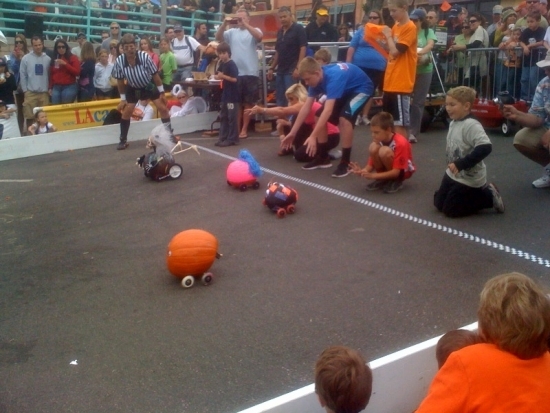 To make it a bigger event, not to streamline it. I would even like it to become a week long convention with the finali being the A.A.K.F. U.S. Nationals. Participation at Nationals is extremely small. The idea of streamlineing is counter productive. Lets look for away to make it a bigger event, not a way to "hurry to get our medals", "meet our requirements", "then hurry and go home". Go there, be there, benifit from being together. This is the magic of there gatherings. The spirit has been lost. This year there will be one less competeitor there. Sensei wanted greater participation FROM ALL! We have many (instructors, judges, members) at Nationals that have become comfortable watching from the sidelines. I feel that these instructors and judges & memeber, at least every couple of years, should be required to compete. Sensei wanted greater participation FROM ALL! Training is for life and we must continue to challenge ourselves. Nationals should be a showcase for who and what we are. 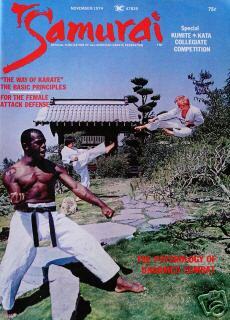 We are not "Sport Karate". 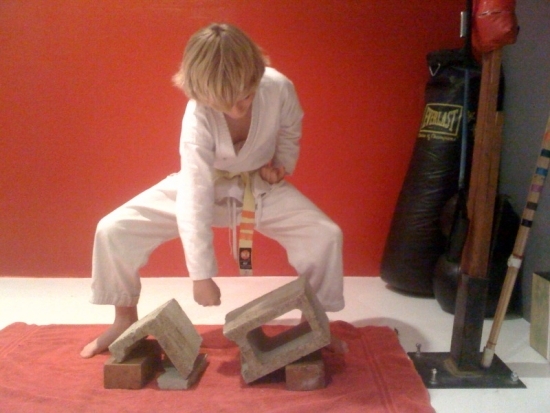 Traditional Karate is for the young and the mature. We must not just wear a gi and belt. We must learn, teach, demonstarte, compete. There is no age limit in the non combat events. We must do ourselves, what we ask of others and our students. All of you must have seen sensei do his performance of Hangetsu on YouTube. Sensei too was always challenging himself. We must do the same. 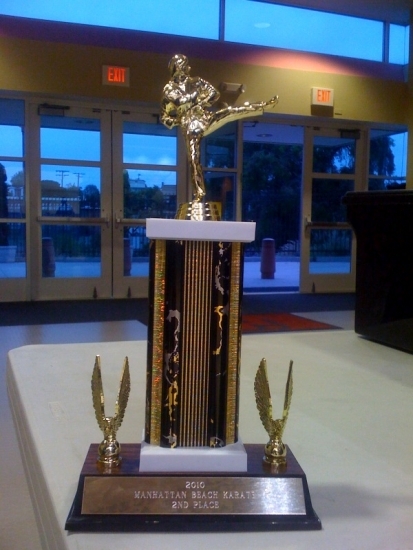 Karate is training for life. Our Nationals is our one big (U.S.) event. U.S. participation at the San Diego Summer Camp was extremely, extremely small. When voulenteers were asked for the Goodwill Tournamet, everyone would be sitting on their hands. Not having camp this year is truily sad but . . . . HEY VERY FEW FROM THE U.S. HAVE BEEN SHOWING UP! When was the last time you were there or the time befor that? "Turn of the Century/Millenium Changes"
This is what we are all experiencing. This is the challenge we are all faced with. This force is the root of many of our problems. If we don't reconize this force we fault others for the problems we face. The world has changed, is changing. We are shifting from one period to the next. We must reconize this change and adapt to it. It's in everyday life, it's in world affairs, it's in the reorganization of the I.T.K.F and the A.A.K.F., it's eveywhere. Once we reconize it then we can deal and adapt to it. Sensei often talked about change and how it should be approached. This years San Diego Summer Camp is cancelled. I felt this would be the case two years ago. Even with sensei as the draw participation was declining. U.S. participation was shameful. If we had huge U.S.participation you can bet the camp would continue. Without a major draw I felt no one would show up. I felt there needed to be a big draw for last years camp to continue (the draw was Shirai sensei). During that camp I strongly felt no one would show up for the next years camp. 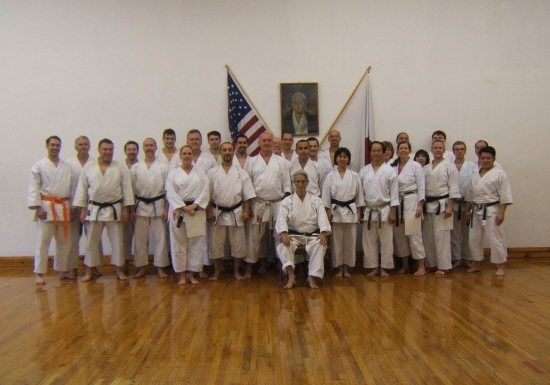 The week before last years (Minnesota) U.S. Nationals Kanazawa sensei had a seminar in near by St. Paul. I was shocked to find out that fewer than 20 showed up. I mean this is Kanazawa Sensei. So you see it's just not us (our organization), it's the changing world. We must plant seeds and grow. This is my mission. With a state of the art facility (built for karate) in Poland. I don't fault anyone, don't fault me. The world has changed, is changing. We must stay straight and upright. We must do what's best. We must reconize that the world is in a different place. We must be forgiving, welcoming, we must to work and make things work. The future is very, very bright, we must not miss it, or put our energy in the wrong place. For viedo of the event contact me. The file is too large to place here. When in L.A. please come and visit. Lets us know if you need a place to stay. Use our "Class Re Cap / Schedule" Page to stay current & up to date. Please share anything of interest with us. Stories, photos, events. Subject: Lets Carry The Flame ---- Forever! This year has been a peach. 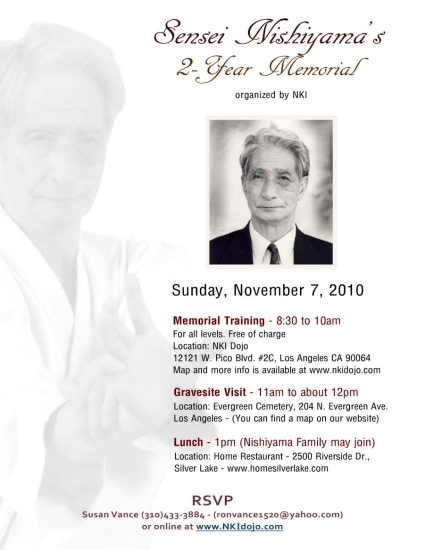 After our great leader and Sensei, Nishiyama-San, passed away the AAKF Board of Directors, Officers and AAKF Regional Directors have stepped up to the plate to fill the void left by our founding father. Further complicating matters was the terrible loss of the very heart of our organization, “Miss Aiko”. 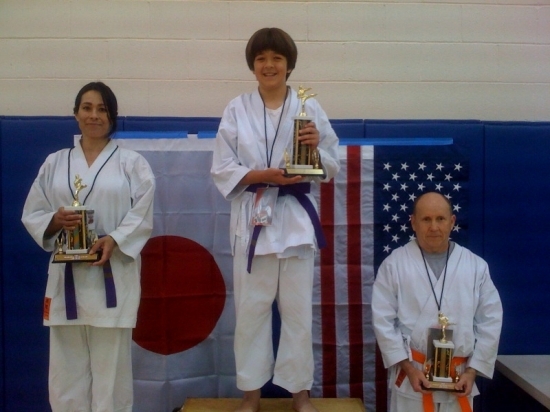 Aiko Tori gave her whole life to the development of the AAKF without reward or recognition. As many of you know Miss Aiko had Alzheimer’s, and consequently our administrative fitness was compromised. Our job is to finish any work not done and turn the leadership over to a newly elected board of governors, directors and officers in early 2010. My job in this effort is to ensure that Everyone Has A Seat At the Table! In the past Sensei did it all and we let him. Now it’s our turn to carry the burden and do it correctly. This direction is the result of many meetings and discussions with AAKF Regional Directors and the current AAKF Board of Directors. 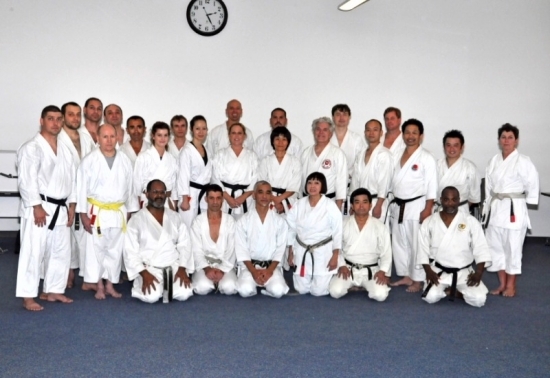 It is our intention to carry on in a manner that reflects Sensei Nishiyama’s goal for karate students no matter what style, organization, or lineage and provide a common forum to share the spirit of traditional karate. In the past many of us did not know exactly what type of organization the AAKF was, a corporation, yes, but what type? The AAKF is a “Public Corporation”, specifically a “501-C-3” Corporation with a “170-C-2” designation. As such it is public charity corporation and open for anyone to join. The AAKF is a forum for all who were smitten by this great art and where our strength is in our tradition and our diversity. Please help me do this work. Please come together to keep the flame. 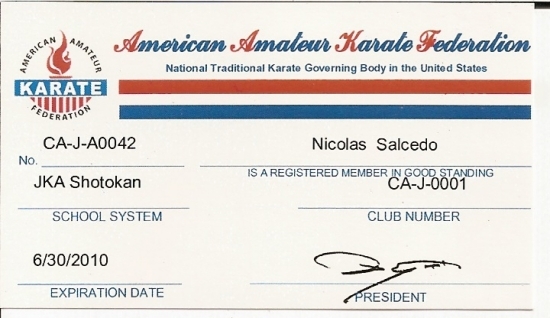 Once a Karate-ka, Forever a Karate-ka. This letter is directed to whom it may concern, to my club members, the Western Region, to all AAKF and all ITKF members and to anyone else interested. What I see what I’d like to see. We are now at the cross roads. Everything that was done in the past brings us to where we are now. It’s time to take inventory of we have and move from here. The organization - AAKF & ITKF. I see that we are in the process of re organizing. I have no idea what that process is. How we were organized in the past now seems to have to be re assessed and re negotiated. I see some going their own way, I see some staying and I see some just dissolving . As I look around I see that the number of local clubs have declined over the years. 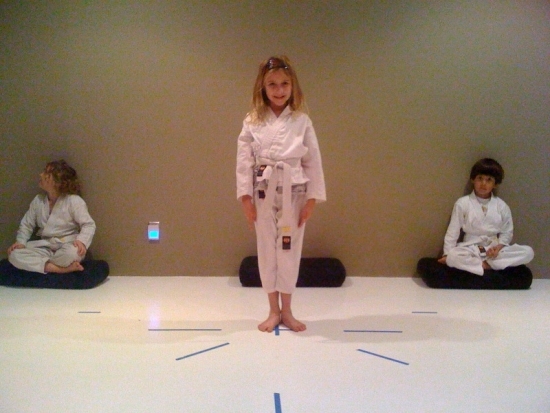 The best gauge has been the Central Dojo Dan Exam. The last Dan Exam at Central, sadly to say, there were just a few present. 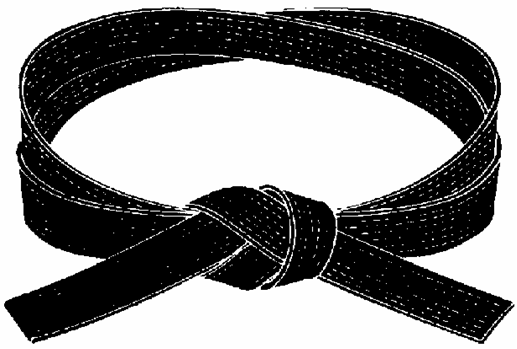 Seeing the number of Brown Belts decline over the years has been a clear indicator of membership and club decline. 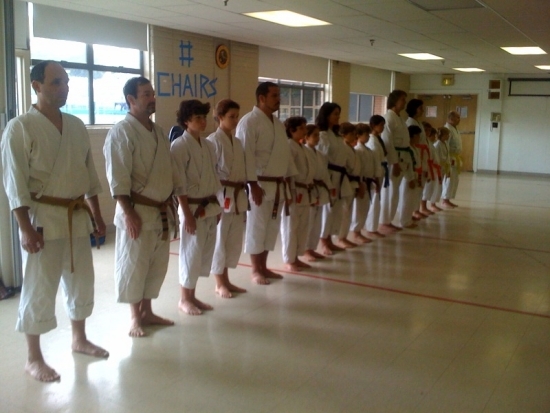 I remember seeing large numbers of Brown Belts showing up for the Dan Prep class, the week/weeks prior to the bi annual exam. As time went on the numbers declined. Declined to the point where the Dan Prep class was eventually eliminated. I remember visiting and training at the local clubs, having this great exchange of friendship. Visiting Steve Ubal in San Diego, Tom Davis in Ventura, Yabe sensei in Gardena, John Habura in PV, Vern Vaden in Tujunga and others in between. Clubs are now far and few in between. We need to close these vast gaps. What I would like to see in this re organization as priority number one, is a plan of major growth and expansion. What’s the use of having a governing body if there are no members. I would also like to see this plan put in place in every country around the world. I recommend that all senior students and even top junior students go out today and start a club. Over night the number of clubs can grow 10 fold. To the senior members. . . what the use of accumulating knowledge if your not going to share it and pass it on. The time to act is today, right now! Yes we must stay together but we need to go out and bring in new members. If not we will slowly dissolve through attrition. Starting a club is easy! You can start in your garage or living room. You can check with your local schools, churches, women’s clubs or even where you work. If you are more aggressive, the bad economy has opened up opportunities to pick up locations at favorable rates. In many areas you can even negotiate free rent, (I’m trying to keep this short, I can expand on all these points.) but now is a fantastic time to plant seeds for the future and aggressively move forward for what will be a very bright future. A model is already in place. There is major growth, expansion, excitement and accelerated momentum in Poland. We must act as if these things are happening in our area as well. We must use their momentum as our motivation. If it can happen in Poland it can happen here, in South Africa, in Spain in Argentina, everywhere. But it won’t happen by it’s self. As part of expanding the number of clubs, simultaneously we must develop a strong Teachers Training Program on how to develop the student. We must crank out qualified instructors. We must have a consistent “Standard”. If we don’t act now, some will go their own way, some will stay and I sense that the trend is one of decline. Prior and or in conjunction to this we must have and develop a teachers training program on how to develop instructors to a higher level. Sensei was the ideal leader. We followed his way, he had the best vision. I see the need to have a governing organizing body that benefit’s the needs of all. Our (US) form of government has three branches of government to keep checks and balances. To ensure that an even playing field is in place, not just for the majority not just for the minority but for what is right and what should be. I would like to see something similar in our organization. I would like to see our governing body keep us up to date with local, regional, national and international happenings. With today’s technology there is no reason not to be 100% informed with all that is “going on “ and “in the works“. Our lines of communication and information must be state of the art, if not cutting edge. We must develop localism globally. We must be one unified body. We have not skipped a beat! We will soon introduce our newest, our third generation of advanced students. Our plan will continue as it always has. 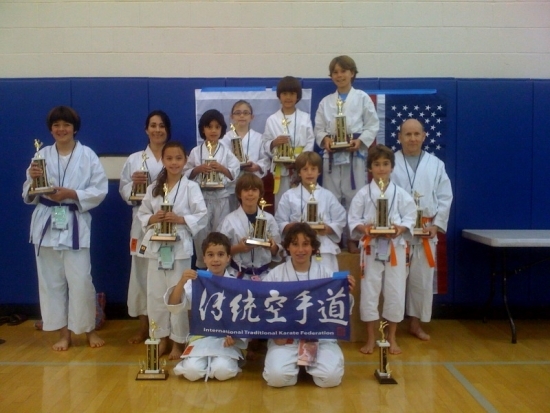 We will continue to offer the highest quality Traditional Karate as taught by Master Nishiyama. We will continue his work and take it to the next level. We are expanding on all aspects of his “system”. Our dojo is the “Lab” for this continued work. We’ll teach to those who want to compete or not. We will teach to all those who are eager to learn. We are aware of the different needs of all. We will prepare for Regional, National and International competition. 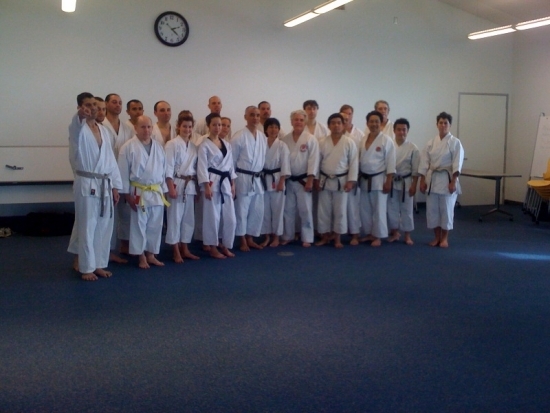 We will train all aspects including Kata, Kumite including Ko go, Team events, En bu & Fuku go. Weather we have a venue to participate in or not, we will still continue in this fashion. Even if we hold our own little mock International Event, with the only reward is . . . know you demonstrated the highest level of kurai. But we will be fully prepared! 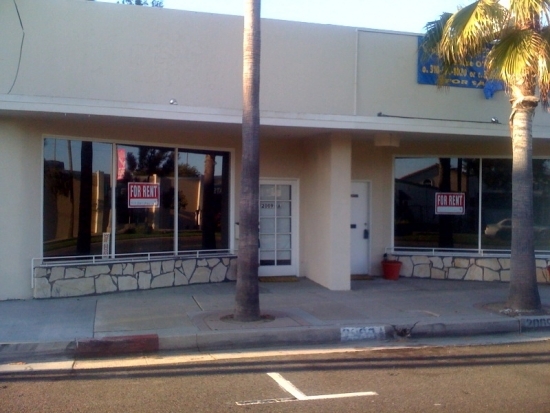 We are aggressively looking to add locations, we are looking to make Manhattan Beach (the South Bay area) a destination for Traditional Karate as it is for Brazilian Jiu jitsu. We added a second location last December. It took it’s toll on our stability, but now (after 9 months) this new location now stands on it's own (keep in mind this is in the worst economy in almost 60 years). We will aggressively encourage others to start a club. We have a couple who will probably have their own clubs at the New Year. As our teen students go off to college we are encouraging them to start a University club that they will hand down, it will be perpetual, awaiting new arrivals every Fall. As they graduate and relocate, to start a new club again. We have just launched a 2 year teachers training program. Covering all aspects of instruction. My almost 40 years of experience. A couple of years ago I estimated over 15,000 class hours taught. This program is open to everyone. It may be taken in parts. I don’t feel we are lacking technical direction as I have trained with sensei for almost 30 years. We were the testing ground for his final work. There were many secrets to be learned (if you were paying attention, I feel most don‘t even know they were secrets). I’m not saying I have nothing more to learn, this is not the case by any means. Even today I’m still learning from him. I’m getting lessons from him everyday. I got into his rhythm a long time ago and it was just so obvious what we were in store for next. In fact I would often predict to my students (if they were paying attention) was on tap. I would anticipate it and prepare for it. We are friends to all and open to all. We welcome you anytime and hope you will invite us. We know the choices you make are as you see best. We wish everyone the best of success! I didn't expect such a quick response! See . . . . . ask and ye shall receive! After a 1 year period of mourning had passed, the Western Region has now gone into action. After concentrating all efforts in the past in obtaining as much knowledge from sensei as possible (Robert Stevens made a beautiful comment about this.). Specially the past 7 years sensei pulled out all the stops in cramming it all down those that were around to listen. In the past the Western Region was guided by sensei (who could possibly do a better job). Now following his framework in place. The planning for 2010 has gone into action. The first stage in planning for 2010 was put into action. 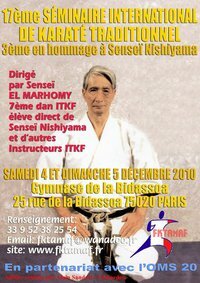 On December 6th, 2009 a Friendship Karate Seminar was held. The seminar was held 3 minutes from the Los Angeles International Airport. In a brand new facility, beach side with a ocean view. Representatives from as far north as Fresno, as far west as Riverside and as far south as San Diego were in attendance. Remember this is a town where it can take 40 minutes to go 10 miles a worse than average economy and high gas prices. 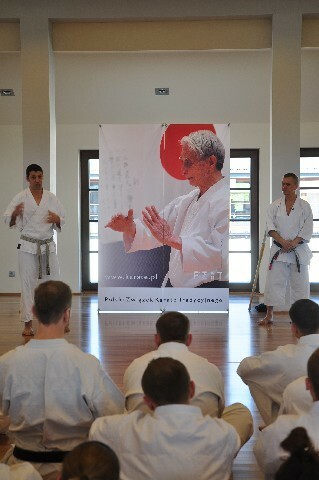 The seminar was co instructed by none other than Avi Rokah & Toru Shimoji. Avi gave us a flier re capping all his instruction. This was a great way to forever keep his instruction. It was great to be on the floor with the team. The seminar was followed by a delicious lunch put together by Susan Vance and Janice Tori. Great sandwiches, home made sushi, delicious over stuffed chicken pot stickers (my favorite) and home made candy. After lunch we had an informal meeting to set the stage for the planning of 2010. Our Regional director was on conference call due to being out of state on personal business. Concerns were expressed and addressed. The free forum brought to light the focus for the new year. Well as suggested. . . for anyone to present a scenario for the new year, here is mine. For this new year I would like to see San Diego step up to the plate. I would like to see it out of LA. I would like to see Falah Kanani - 6th Dan (no one else is higher in our region) & Peer Halprin co direct our region. Regional Tournament site, seminars, pet projects, etc. I would like the logistical committee (Ron Vance & company) to stay in place as they did such a great job in co ordinating today's event. I would like to see a communication/ web committee showcase what we have to offer and keep us all informed, on all levels. I also feel we we should address isolated clubs or individuals that may feel neglected. There is no need to get too complicated. 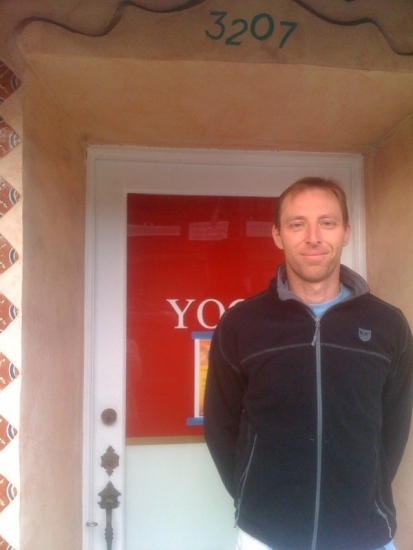 Also my suggestion for 2011 Western Regional Director would be John Legget from Sacramento. 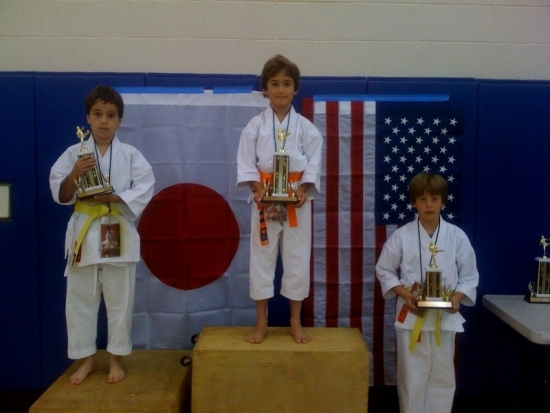 He is an instructor, he has come down to Central on a regular basis to train with sensei, he participates at Summer Camp & has competeed at Regionals & Nationals. We are all limited in what can do but he has well rounded AAKF participation. For 2012, let's see what happens in 2010 & 2011. Perhaps Riverside, High Dessert? The reason I didn't mention Rokah sensei is because I beveive he is needed to work on a a grander scale, at the International level. Lets' get some fresh air, new blood in the AAKF Board of Governers. The future is bright! Oh! I feel we need to contact all clubs listed in our region map. If they have zero involvement (not limited involvement but zero involvement) with the region then they should be, must be removed from the list. But the door must be wide open for future involvement. With the succes of this meeting it appears like we'll need a larger facility for the the follow up meeting. There were many hands, moral support by those that could not attend and great effort put forth. A fantastic future lies ahead! If you missed today's meeting then you MUST be a part of the next one to accelerate the momentum put in place. With the possitive enrgy put forth we have one student stepping forward and starting his own club. We are friends to all. 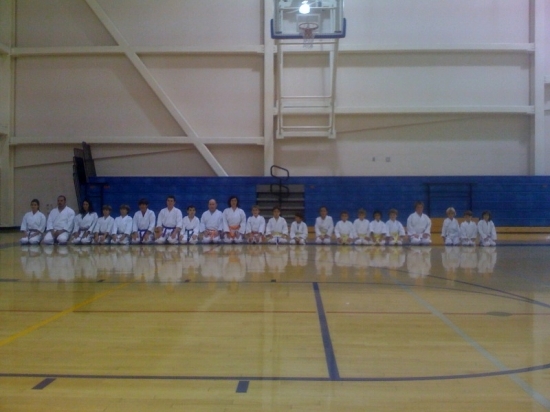 We are friends to all that teach Martial Arts in a positive manner. We wish you well & support your efforts. If you want to be in a different organization we wish you well. If you don’t want to be in any organization at all we wish you well. If you want to bounce around to see what fits best we wish you well. If you want to start your own organization, give it it’s own name, call it what you want, you can do what you want, you can do as you please. 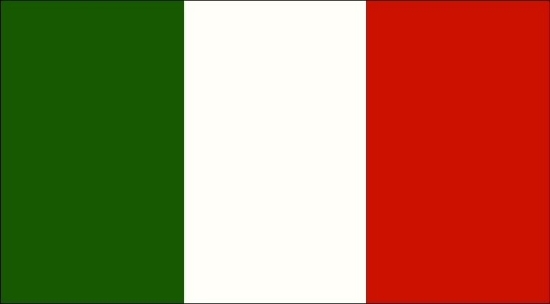 This is a free country as is a large portion of the world. You are respected because you are putting YOUR NAME on it. We wish you success. 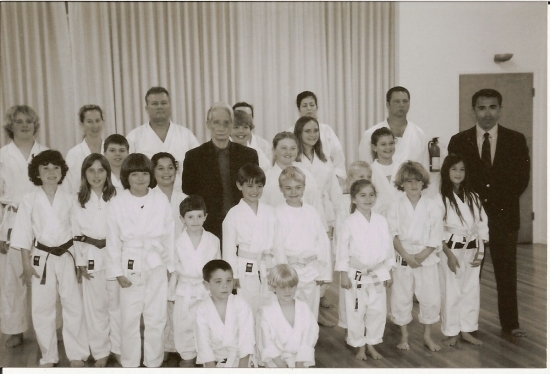 Our position is that we can not support those in sensei’s organization that do not follow the framework that sensei had worked all his life to put into place. It’s like changing his final Karate system. We cannot support anyone who wants to continue his work by taking it apart. Sensei covered this subject in class several times . Wow it's 3:19am I'm tired! Hey anybody want to do a class now? 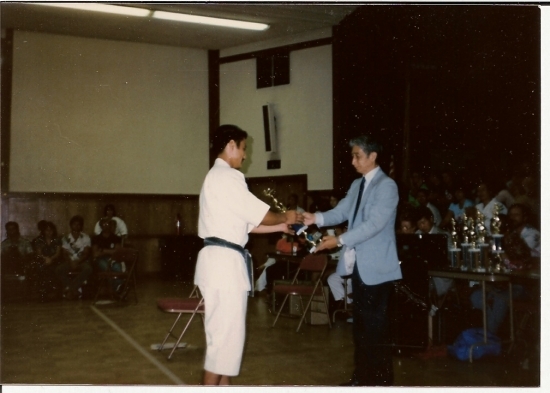 Toru Shimoji sensei receiving first place trophy in Kata by Nishiyama sensei. Notice how dark sensei's hair is. As far as I see it as far as I know. Please correct me if I'm wrong! Come December 31st, 2009, Everyone's AAKF club membership and individual membership expires. Some certification is one year or two years (coaches, examiner, instructors, judging etc...), at the end of their term... expire. Some of these have to be renewed after participating the full week and taking the exam at Summer Camp and paying up the fees. 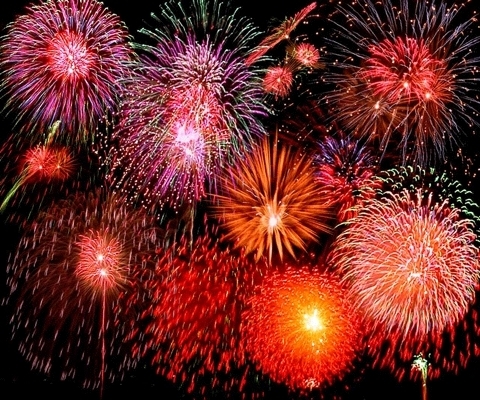 Our Western Regional director’s term and committees expire on December 31st, 2009 midnight. The Western Regional meeting is coming up. As was the AAKF Board of Governors meeting held in Minnesota at Nationals, this too is to be a closed door meeting. To be attended only by 1 representative from each registered club. The meeting is to made up of one representative from a Registered club. A club with a certain number of registered members may have one vote, those clubs under that number (I think the number is 22 or so) of registered memebrs may be at the meeting, but have a zero vote. No others can be in the meeting or have a say. Any appointments, decisions, plans, bla bla bla. . . . made under any other circumstances, are illegal, null and void! So if you want to be in the meeting...then you have to register your club and your students, about $400. If you want to be in the meeting and exercise your one vote, then you have to register your club and and minimum 22, plus students, about $800. Sensei was such a genius in having established a wonderful framework TO BE FOLLOWED! Anything other than what is established, is circumventing his wishes, ideals & planning. I hope everyone will follow this/ his structure. If the structure needs to be changed then it should be done under his frame work to do so. If this is not correct or if this will not be the case come January19th. . . . . then please let us know now. I'm just wanting for there to an even playing field for all. Our Region is vast, I would like for all to have a chance to patricipate in all levels of our organization. If I'm expected to play then I want to know what the rules are and that they will be followed. Sensei covered this subject in class, several times. I thank you and welcome your thoughts. Karate teaches us to adapt and to adjust. Back in the 60's Orange County, the Inland Empire & Santa Clarita didn't exist. LA was a small area. Now it is vast and we are paralyzed by traffic and making a living. I suggest that we pose a challenge to all clubs who want to be part of the Western Region or to join in 2010, to hold their own Winter Training Monday thru Friday. Then instead of them holding their own Saturday final class, we all converge to a central location on a Sunday. While waiting to see if we were going to have a Winter Training in 09, after no word, we started our own. We had 3 students, I’m sure we’ll have more this year (we‘ll be thrilled if we have 6, then the year after that 12). This is how things start. So let’s have greater participation by having more venues. Then we all converge on one day with our bigger numbers. If we hold the final day on a Sunday, we will have greater participation. If we have it on a Sunday then instructors don’t have to cancel Saturday classes. Saturday is usually a big teaching day. If we have it on a Sunday our friend that can’t make it due to religious reason will attend. Again potential greater participation. Also less guilty feelings for not being able to come to LA. In the about 17 Winter Trainings that I’ve attended probably the record for a Saturday was maybe 25. If we spread out to encourage greater participation and encourage even a bigger Sunday. It is very possible to have the biggest number ever at the up coming 2010 Winter Training. If we really PUSH..... we could have 150. Official Certificates could be handed out to those who trained the whole week. I also suggest the class should be just old fashioned hard training (but correctly). We can leave the technical detail for another day. Big numbers and loud kiais. We could also script the class so we can all be in sync during the week and for the final class. Again! through planning and hard work we can be the cutting edge! Success through adapting to world changes. 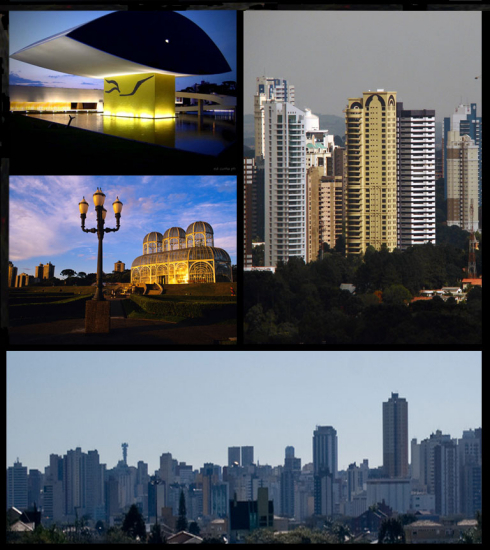 Please submit any interesting photos you would like to share. Wow talk about a flash of memories from the past!